November 27th 2013 – Mr. Ramón Escolà, President and founding partner of Zeta Espacial S.A., participated in the Marketing & Market Investigation Master Conference organized by AECOC for the Barcelona University. AECOC´s “University-Company” Project aims to open a bridge between the business and academic worlds and offers a program of conferences where experienced business leaders share their experiences with future professionals and executives. 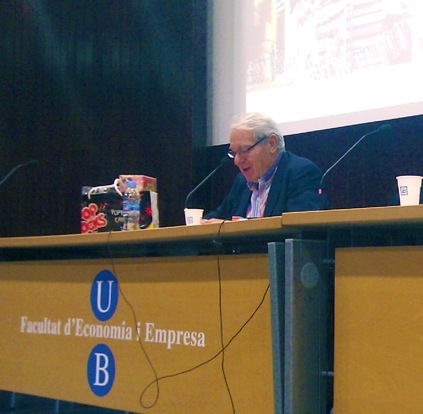 Mr. Escolà, inventor of Peta Zetas® popping candy and founding partner of Zeta Espacial S.A., shared the experiences, efforts and investments hidden behind the packs of well-known iconic Peta Zetas® candies. He created the atmosphere for a very interactive lecture, with students participating and placing questions about the company´s internationalization project that started back in the 80´s. Mr. Escolà emphasized the importance of innovation and international expansion for the company, that nowadays exports its range of products to more than 60 countries worldwide and has two subsidiaries in the American continent (USA and Mexico).Zeta Espacial, celebrating its 35th anniversary in 2014, keeps the same initial energy, with strong commitment to quality, effort and team spirit, looking towards a future of brand support and internationalization.